Rescue - Southern Platte Fire Protection Dist. Three Southern Platte fire trucks and one ladder truck carry hydraulic rescue equipment and all personnel receive regular training in its use. 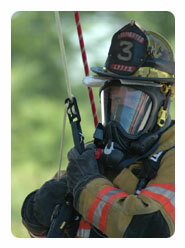 In addition, two of the fire trucks carry pneumatic bags capable of lifting several tons. These tools are indispensable in extricating victims from traffic accidents and industrial mishaps. All responses to calls typically include two fire trucks and one battalion chief. The Kansas City Metropolitan Region is also equipped with six (6) Heavy Rescue teams dealing with high angle rescue, trench rescue and homeland security and domestic terrorism preparedness efforts in the event of any type of collapse. These teams’ training focus is to bring teams together for training to promote one regional-team concept. They continue to partake in annual regional exercises in order to become more proficient and to assist in the identification and development of future training, equipment, and resources. Southern Platte is deeply integrated into the regional approach through the Regional Homeland Security Coordinating Committee and the Heart of America Metro Fire Chiefs Council. The common theme throughout is a regional approach with the utilization of regional assets. This allows organizations to become very proficient in one area instead of trying to be proficient in everything. This has permitted Southern Platte to be able to call upon this resource incase the need ever arises, providing the patrons with a well trained team to assist in heavier rescue incidents.